A common defect you can expect to find, when inspecting avocados is surface discoloration. Discoloration can have many different looks, such as discoloration caused from russeting, from sunburn, or from unexplained transit or physiological conditions. 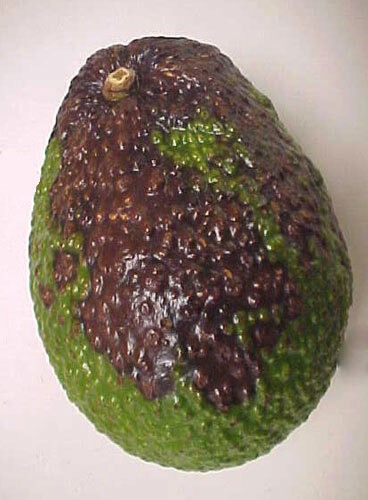 As seen above, this is typically how you will see discoloration on your avocados. It will range from a dark brown to black in color and may affect only a small area or most of the fruit. Remember not to confuse discoloration with the natural ripening process of some avocados. And also, even though the discoloration will blend in after the the avocado ripens, you still base your inspection on what are seeing right now, not what it might look like in a few days. But how do you score this is a defect? The U.S. Grade Standards offer a little help with a scoring guideline, but it still takes some interpretation. If the discoloration is light brown in color you are allowed up to 10% of the surface with discoloration. If the color is lighter, you are allowed a greater area, if the discoloration is darker in color (than light brown) you would be allowed less than 10% of the surface being affected by discoloration. With 50% of the surface showing in the above image, I have illustrated 25% of the surface area with the white line and 12.5% (1/2 of 25%) with the orange line. The red circle depicts approximately 10% of the surface area, the maximum allowed for light brown surface discoloration. So obviously the discolored avocado shown above would be scored as a defect. It easily surpasses the area allowed for damage (10%) and the area allowed for serious damage (25%). Because the discoloration is black in color you would be allowed less of an area allowed for light brown discoloration…..in this case about half the area. With black discoloration you would allow approximately 5% of the area affected before scoring the avocado as damage, and 10% of the area affected before being scored as serious damage.